Just about everyone has some type of muscular imbalance. This might take the form of one set of muscles being relatively strong compared to another, such as having a strong chest relative to the back or strong quads relative to glutes and hamstrings. A client might also have asymmetrical muscular imbalances, such as when the right glute is stronger than the left glute. A given muscular imbalance tends to create a domino effect because our nerves, muscles and bones are all connected via the kinetic chain. For instance, the lats attach to the pelvis and shoulders. If the lats are short and tight, it anteriorly rotates the hips, rounding the lower back. This loosens and inhibits/weakens the glutes. The hip flexors, including the tensor fasciae latae, are then shorter and tighter, causing the knees to roll in and the arches of the feet to collapse. So who cares and so what? Well, muscular imbalances are often the root cause of common ailments. Have lower back pain? Suffer from joint pain, maybe in your knees? There’s a good chance a muscular imbalance is at play. Moms have a special reason to suffer from muscular imbalances: the way we carry our babies. If you’re standing and holding your baby, you probably always place her on the same hip and sink into that hip. This can cause pain in your lower back, hips, and knees, among other things. If you’re walking around with your baby, you probably always carry him on that same side of the body. This can tighten your chest muscles and weaken and loosen your upper back muscles on the carrying side. 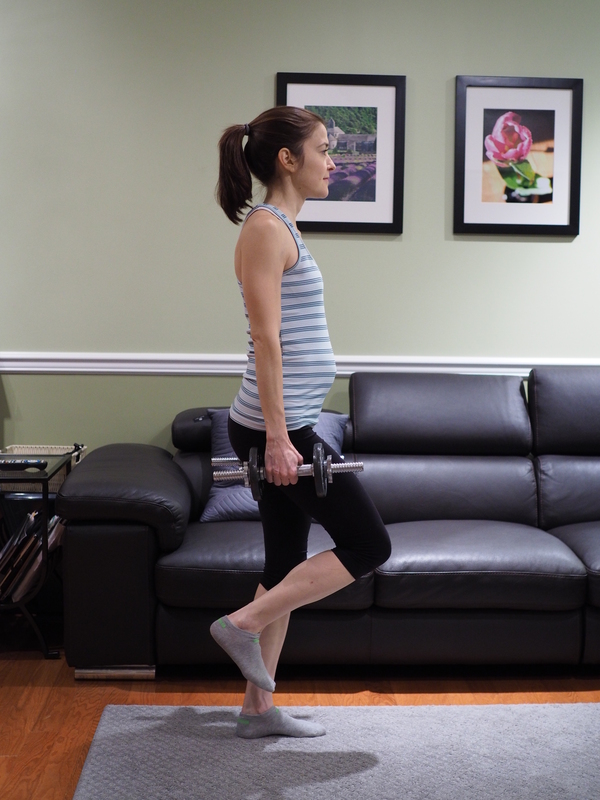 WellMom takes a corrective approach to resistance training that addresses these muscular imbalances. In addition to focusing on strengthening weak muscle groups and stretching tight ones, I employ unilateral exercises – those that work one side of the body at a time – whenever possible to correct those asymmetrical, left-right imbalances. Below are five of my favorite unilateral exercises. In some of them, notice that I’m holding a dumbbell in one hand only. This forces your core to work harder (a good thing!) because you’re activating the muscles of your posterior oblique chain – the latissimus dorsi and oblique on the side of your body with the dumbbell, and the gluteus maximus on the opposing side. Incorporate a few of these exercises into your next workout and let me know how it goes! It’s a little hard to tell here, but I’m holding the dumbbell in one arm only. If you don’t have a Swiss ball or find this exercise too challenging when using it, place your rear foot on a more stable surface, such as a chair or step. Congrats!!! You look adorable as usual. So happy for you!!! !